I have to say, Graze have really stepped up their game. 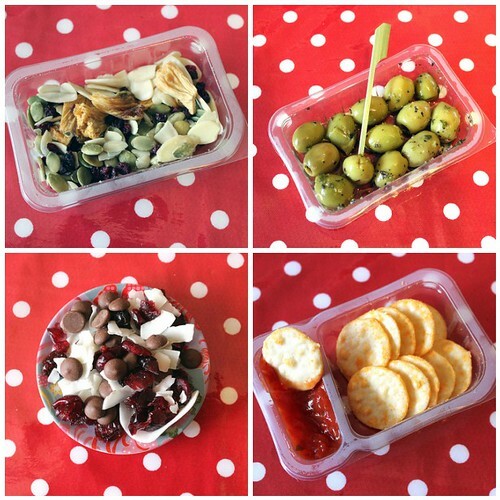 The company creates boxes of nibbles and snacks that they send to you (postbox friendly!) on a weekly schedule (or daily, depending on how much you like Grazing!) so you can eat healthily at your desk. Anyone who has ever tried dieting for any length of time will be able to tell you that healthy eating and low calorie eating are not the same thing. Avocados are a case in point. Full of healthy fats and vitamins, these beautiful little fruits will set you back 160 calories for 100g – about double the calorie count of an apple. Thusly, addicted as I was to Graze’s delicious offerings, I eventually had to cancel. The boxes could be as much as 800 calories a time, and although you’re not supposed to eat them all in go, I have to confess there were times when the lot would disappear over the course of a day. At the time, I wrote to the company to tell them that I had to cancel because of the high calorie content of some of their boxes, and although they promised to look into it, I have to confess I didn’t really believe them. So now it’s time to eat my… well, not words – thoughts? Anyway, since I’ve been gone, Graze has been busy, and so when I got an email offering me some half price boxes as a New Year offer, I was bowled over by their new ranges when I actually checked the site out. I think when I had left Graze was introducing breads, but now they have a delicious range of crackers and dips, and delightful looking bakes, including an entire range dedicated to my favourite British institution – high tea! 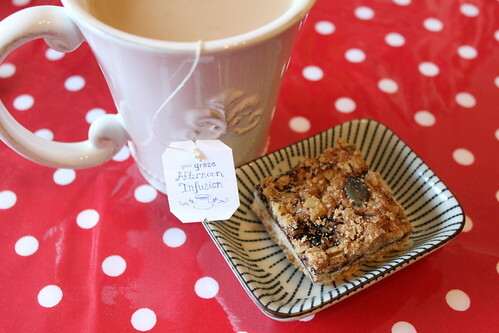 Yes, when they say high tea, they mean it quite literally – they even send you the tea bag! And, it comes guilt-free. As you can see from that logo on the packet in the top right, this is from the Graze Light range. When you sign up, you can select a nibblebox (which I tried first) or one of the Graze nutritionboxes, which comes in three types; the eatwell box, boostbox and lightbox. The lightbox has all of the same great goodies as the nibblebox, except no dark chocolate, or flapjacks. You’ll be sent trays that contain between 50 and 150 calories each (and you get four trays in each delivery). Here’s another little treat I had in my last Graze box – sticky chocolate pudding. 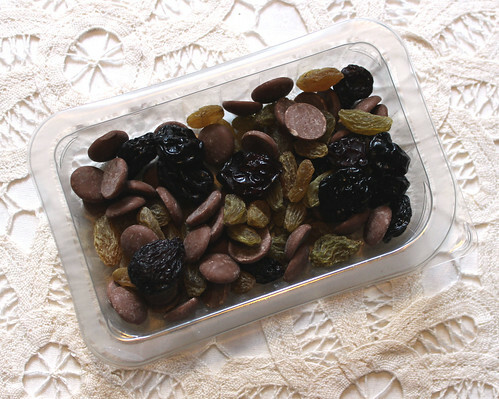 For 176 calories, you get a mix of milk chocolate drops, jumbo raisins and green raisins – not too naughty at all, in my opinion! I also highly recommend the Korean rice crackers – it was Graze who originally got me addicted to these beauties, and for that I am eternally grateful to them! 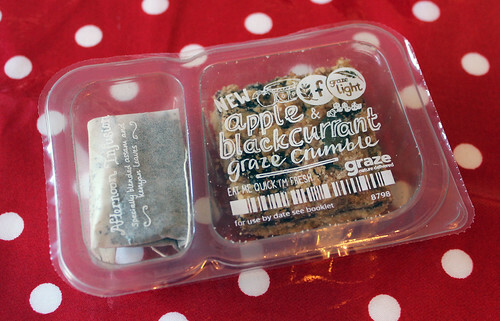 I’m delighted with Graze’s new range – but a little bit disappointed that they no longer offer fresh fruit. I can understand why, because there were times when my fruit turned up a little – well, fizzy. And, sometimes it felt a bit ridiculous working from home and eating grapes that had been posted to me when there was a whole bowl of fruit in the kitchen! Still, I hope that they can include the option for fresh fruit at some point in the future when they can source stuff that stays fresher for longer. If you want to try Graze yourself for free, use my code! Type in 6KDFWFW at Graze.com, or follow this link: http://www.graze.com/uk/p/6KDFWFW. 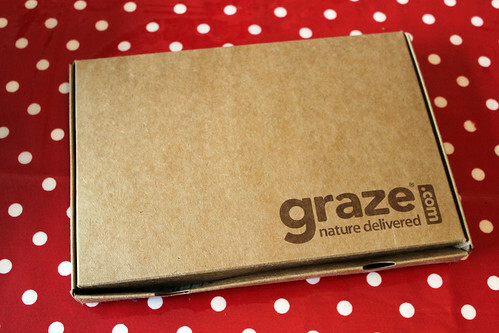 You’ll get a free Graze box when you sign up, and I’ll get £1 off my next order – now there’s incentive for both of us! Each Graze box costs £3.89, and you can cancel any time you like. 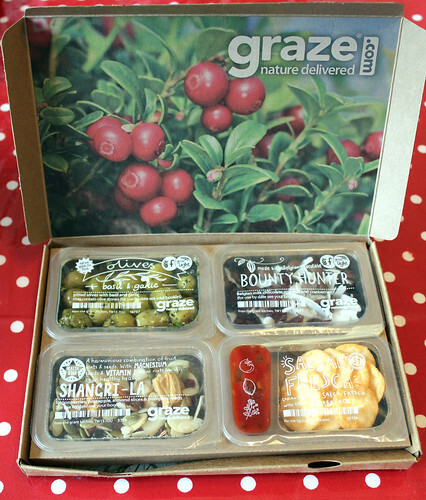 If you already get Graze boxes, let me know what you think!